If there was ever a decade to set the fashion world back in sophistication, it was the ’90s. I was lucky to be young enough that it wasn’t time to strut the styles of the new millennium until high school. Sadly, that doesn’t mean my eight-year old self didn’t try to take on the fashion gems the ’90s had to offer. Every female, toddler or mommy sported these platform black sandals – you know the ones, with the two thick black straps over the top of the foot that were often just made of some kind of foam. Looking back now, I embodied a wannabe model in compostable shoes. Thanks Mom for letting me sport these clunky wonders. I don’t know about the girls in your class, but butterfly clips were all the rage in my neighborhood. And for those who are familiar with the infamous butterfly clip, you know there were two kinds. First were the hard plastic butterflies, sometimes trimmed with glitter and colorful stick-on jewels. The next generation of butterflies were made of metal and had wings capable of a light flutter. So what if they got tangled in our messy buns? They were cool and that was all that mattered. I haven’t been caught dead in a windbreaker since ’98, but before that, my parents had me living in them. And all my friends had them too, because of course, they were functional. It was my question then, and is still my question now, why did they have to be made with such awkward color schemes? It wasn’t enough that they were neon, but they had insane combinations of pink, green, yellow and orange in really cutting-edge geometric shapes. We walked around looking like doodles we made on the computer with Paint. I think the cast of Friends would agree with me that this was an understated trend of the ‘90s. I may have been the only kid to wear my flannel shirt WITH my overalls. These days I prefer one or the other, but there are still a great number of people who are laughing at me right now. I accept that, the eight-year old inside still thinks they’re cool. Who ever said you have to be a farmer to wear a jean-suit? Somehow the butterfly clips weren’t enough to keep us shiny and fabulous, we had to wear glitter in our hair and all over our faces. Not yet old enough to wear real make-up, young girls were convinced glitter and stars looked very grown up when applied generously to the eyelids and temples. I found old photos from those years and couldn’t help but judge myself. I don’t think any of us knew we looked like aspiring strippers. If only there had been a way for our mothers to make us understand? Too late now. Another awful hair decision: the scrunchie. 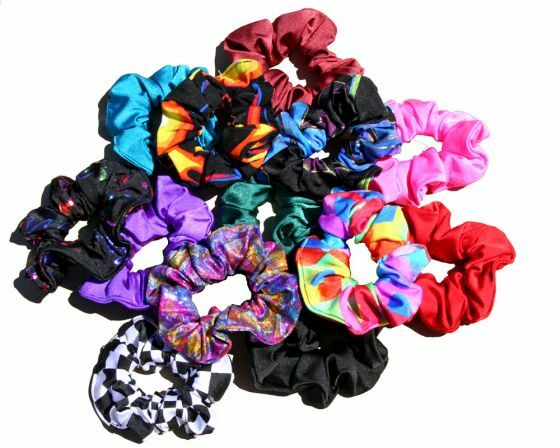 These were fine when used to actually hold the hair back, but as most girls will admit, the scrunchie was used to decorate the bun that was already being held up by elastics and bobby pins. There were prints, fabrics and colors to choose from, making the messy bun quite a popular hairstyle. So who still wants to decorate the hair they didn’t want or have time to do? Scrunchie = lazy hair day. These are obviously just a few of the trends that bring us to cringe at old photos. But let’s keep it that way. Already the neon trend is coming back into style, thank goodness not in windbreaker form. If you ask me, those shorts that Rihanna wears in her new video with Drake are quite adorable. As victims of the ‘90s, it is our job to reinvent these mistakes and bring them to full potential. Although, I don’t think there is much hope for the scrunchie. Good luck ‘90s survivors!